You can retrieve data from Salesforce three ways: Download, Refresh and Reports. Step 1: Clicking 'Download' will bring in all Salesforce records for the object associated with the template. This is not typically desired, therefore Celigo recommends using a Data Filter. 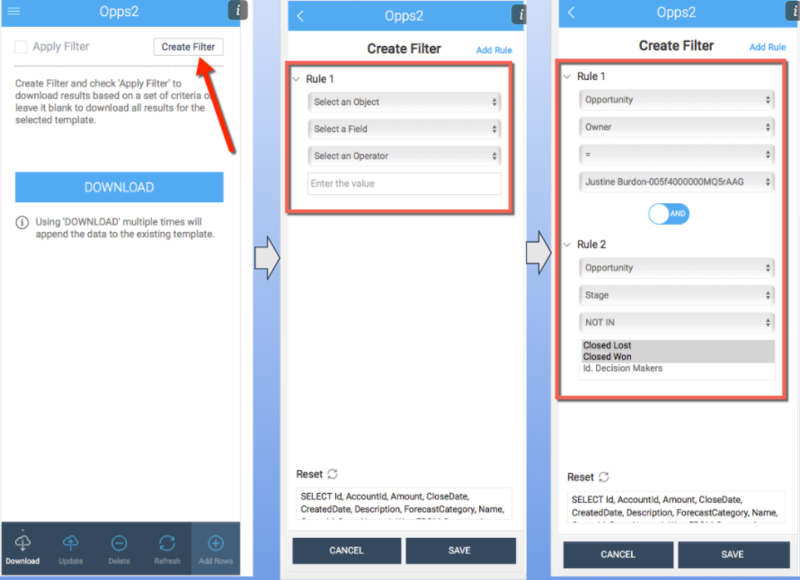 The example below shows a filter created to bring in all opportunities where the owner is "Justine Burdon" AND where the opportunity stage is NOT IN "closed/won or closed/lost". Step 2: After you click 'DOWNLOAD' again in the middle, the relevant records are returned to Excel. Now you can manipulate the data and send it back to Salesforce by updating as described later. Step 1: Take an ObjectID from Salesforce and paste it into the ID field (Column B in Excel) . Click on ‘Refresh’ and it will populate all the fields in your template with the latest data from Salesforce. Refresh also brings latest Salesforce data into Excel. If you have a sheet with previously imported data and wants to update the sheet with latest data from Salesforce , you can you 'REFRESH' option in CloudExtend Excel for Salesforce. Step 1: In the example below the Opportunity Owner field is being updated from "Integration User "to user "Vaibhava". To update the value, just type the name partially in "Owner" column in Excel and CloudExtend will dynamically identify picklist values after you type and auto complete the complete value. Step 2: Once the data you want to update is ready, click ‘Update’ and then check off ‘All Rows’ and then click ‘INSERT/UPDATE’ in the middle. Those opportunities will be updated in Salesforce with the new owner. The Record ID will turn green on each row as the updates are successfully completed. Step 1: Click on the menu icon on the top left hand side of the CloudExtend toolbar. Step 2: Click on Reports. CloudExtend returns what is available to us via the Salesforce API which is currently the 200 most recently run reports (excluding summary and matrix) for the currently logged in user. (note, if you need more control over filtering your data from within Excel you should consider creating a template that mimics your report. This allows for more flexibility because you can use a data filter or SOQL in the App to further refine your results and, if needed, even make changes to the data and push them back to Salesforce. Step 3: Choose the report you want to pull into Excel and click on ‘Yes’. Step 5: Your report will load and data will begin to populate the template from Salesforce. CloudExtend can download only first 2000 records from your report. Make sure to apply additional filters to limit the results count to 2000 records. If you rerun your reports the table is recreated thus overwriting any custom formatting applied. A simple workaround is to record a macro that provides the formatting for your report and then run it after the report is downloaded to reapply it. Record ID's in red indicate an error and the update was NOT pushed to Salesforce. Correct the error(s) and update again.